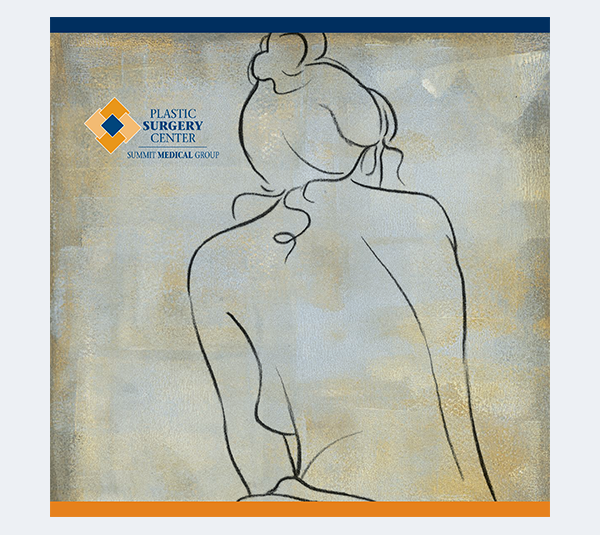 The brochure for the Plastic Surgery Center at Summit Medical Group presented a common problem that most plastic surgery centers have: how to present an elegant brochure for plastic surgery without the “before and after” photos that so many plastic surgeons use to market their practices. On the way into the meeting at the plastic surgery office, I noticed these beautiful, simple line illustrations hanging on the walls in the office. 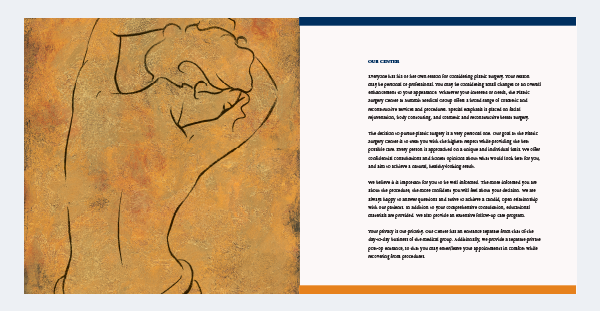 In the meeting, I suggested using the illustrations in the brochure. The office contacted the artist, and we were able to obtain hi resolution photos of the drawings. These drawings promote a feeling of health and beauty without intimidating the patients. 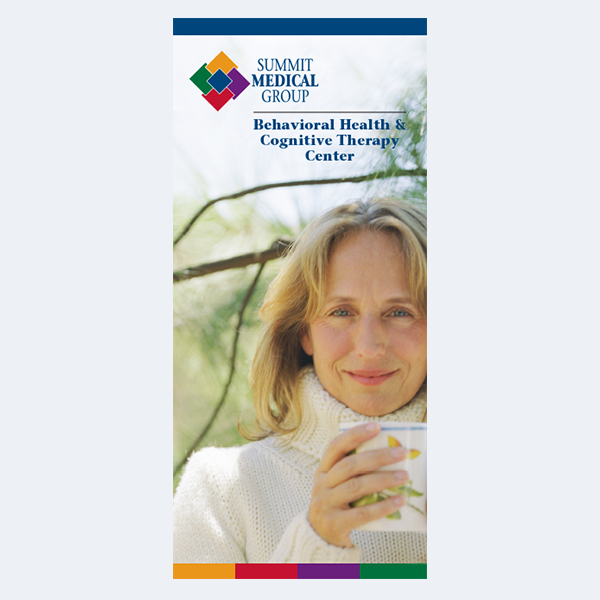 The design for the Behavioral Health brochure at Summit Medical Group set the template for all trifold brochures according to the branding standards which Different by Design developed for Summit Medical Group. The casual photograph of a woman holding her coffee cup outside in a natural landscape evoked a feeling of comfort and ease. The logo for the center at the top could only print over a white or very light background color. 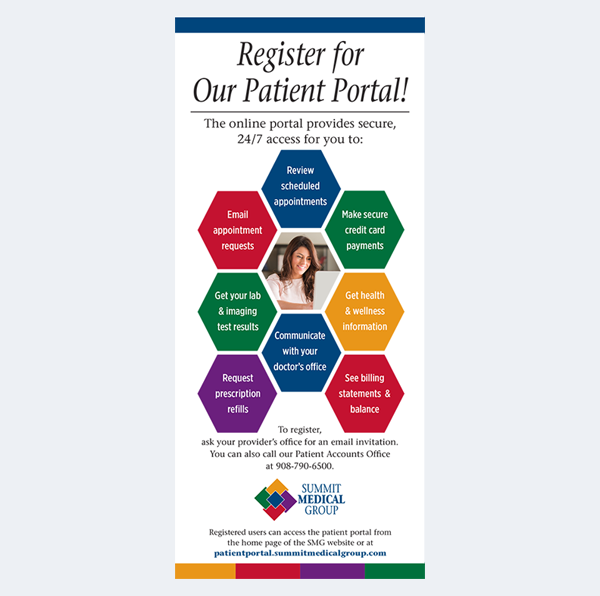 The design for the online patient portal announcement shows patients what is now available online to make patients’ visits easier for all. Online activities include your general medical information, scheduling a doctor visit, test results as well as many others. I took the branding colors and used a new shape – the hexagon – and configuration to be used for many online products that are available for patients. 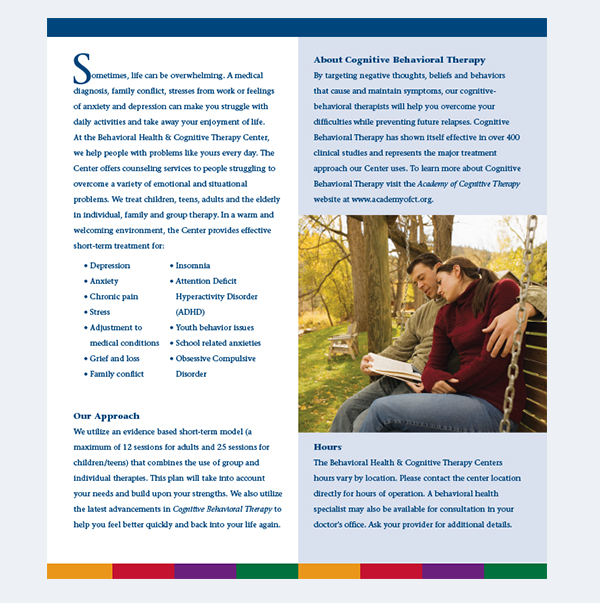 We also produced posters around the medical campuses to reach as many patients as possible. 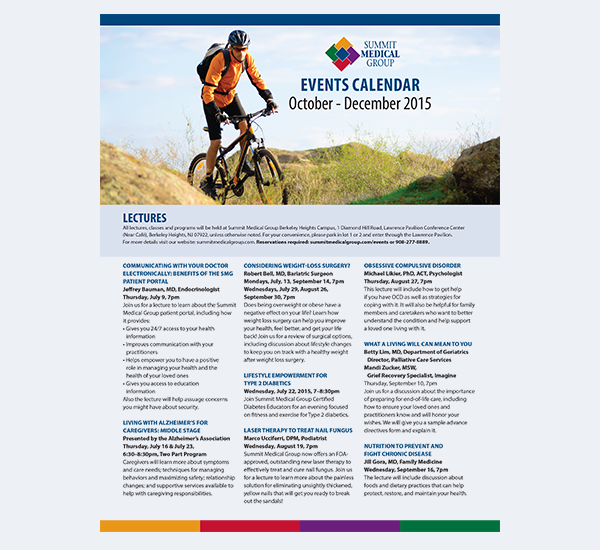 The calendar page is a listing of lectures on various subjects and was released quarterly. All of these pieces have the group branding with blue band at the top and multicolor band at the bottom and the SMG logo on the front of the piece.